I was searching for another diversion from our no child blues and a Valentine Dinner in a lovely restaurant seemed fitting. However, having recently returned from New York (I still haven’t shown you everything) the Memphis options didn’t seem fitting at all. I gave it some thought and begin to realize I had some “pantry” items that could possibly not only be fitting but FABULOUS. I did a bit of research and decided to be trendy with a tasting menu. Recently, we’ve been enjoying our meals at the bar and I felt like a Valentine Dinner could certainly feel intimate there. Admittedly my linen closet is gross a display of indulgence. I could’ve used solid red, solid pink or red/white checked but I was feeling minimal. I chose a hand-painted silk scarf I bought for my mom in Korea, which she always thought too beautiful to wear. Brandt was horrified that I was serving food on it. I love using her things and cooking her recipes. It helps me know her spirit is always near. And yes, I spilled on it. And yes, it washed right out. 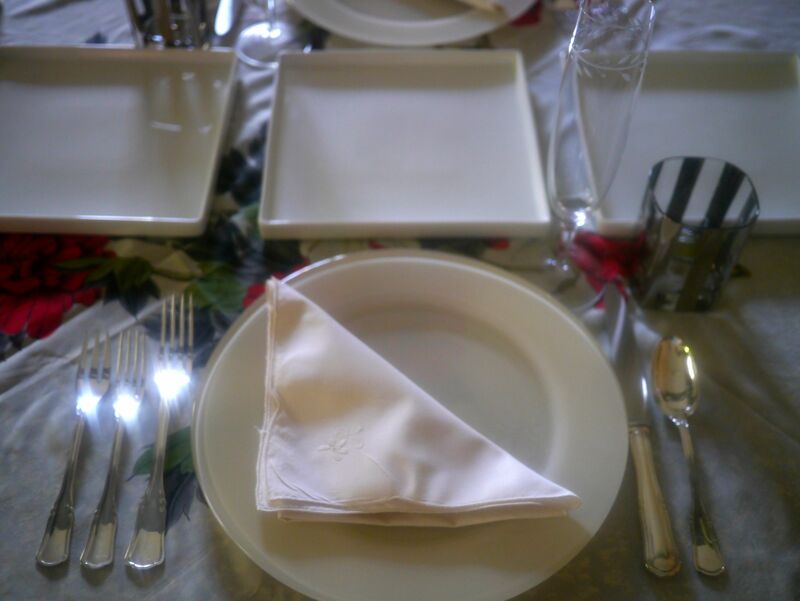 I used simple ivory plates and white serving plates. Those that follow the blog already know Bucky Farnor. He regularly sends shipments of treasures and this display is graced by stunning silver flatware from The Farnor Collection. I recycled flowers from Sunday Supper to anchor both sides of the setting. However, on one side I created a layered effect by using a cake stand with a ring of Dipped Strawberries and placed a vase of lilies and tulips in the center. Let me tell you, if you haven’t found Guittard Chocolate…you haven’t lived. I used Akoma Extra Semisweet Chips to dip the berries and it’s one of, if not the best chocolate I’ve ever used. They just started carrying it at Fresh Market but from now on I will order online if Fresh Market doesn’t have it. On my return from NYC I hosted a design meeting at the loft. I bought several things to have for the meeting and didn’t use them all. When planning the menu I realized I could really turn pantry items and even leftovers into a special meal. I had a wedge of Fromager d’Affinois…a double-creme cows milk brie and a jar of quince paste. 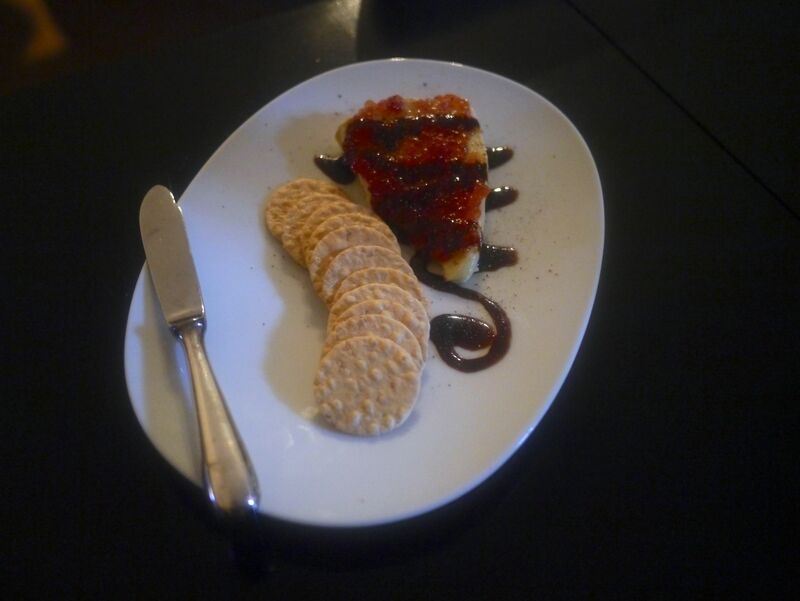 We started the evening with that drizzled with balsamic glaze and served with rice crackers and a glass of Brut Rose Cava. 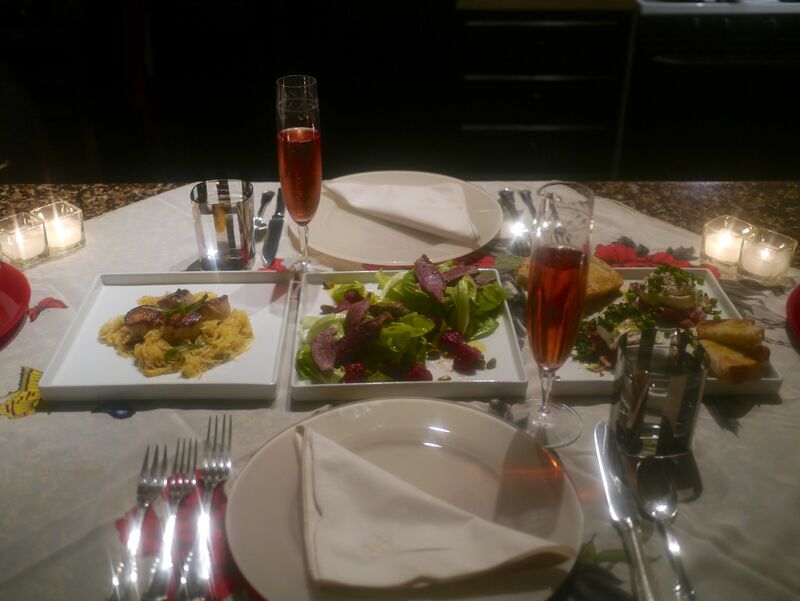 For the three-course tasting dinner I only had to go to the store for speck, fresh mint and tarragon and the bubbly. Everything else you see came from the pantry, refrigerator or freezer. Again, thinking of mom I felt so proud of myself. She seemed to always have whatever was needed to “throw something together”. 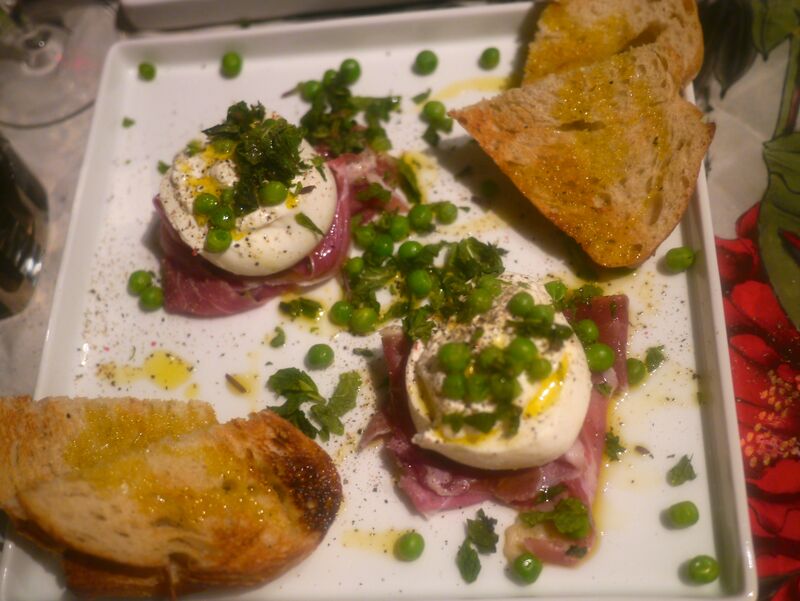 Our first plate was Prosciutto (no speck at the store), Burrata, Peas and Mint. This is very simple but a really fresh approach to the classic antipasti. I drizzled it with olive oil just pressed in November and added several turns of the pepper mill. I had crusty Tuscan bread on the side and must say it could be a meal unto itself. 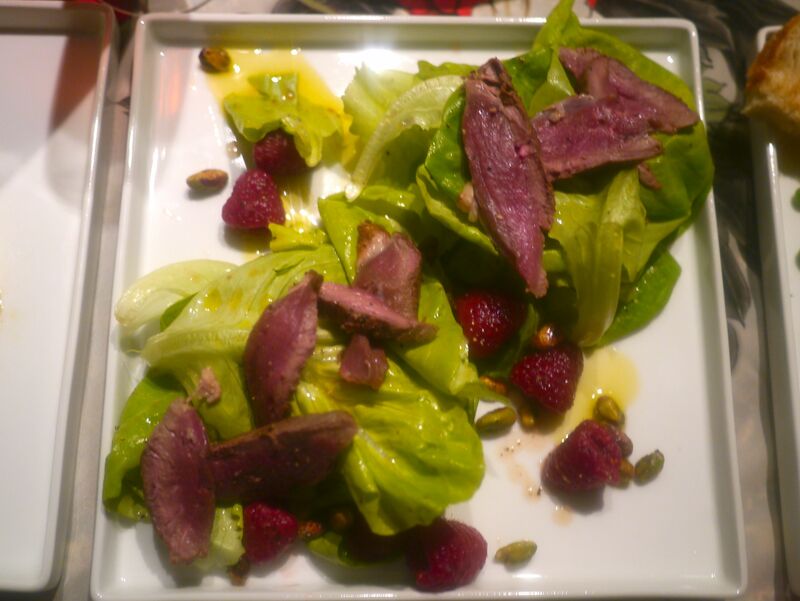 For the second plate, I used a piece of Pan-Roasted Duck left from Sunday Supper with Bibb Lettuce, Fresh Raspberries and Pistachios tossed with a dressing of White Balsamic, Honey, Orange Juice and Olive Oil. The third plate was a simple Scallop dish. I’d had a Spaghetti Squash on the counter for at least a month…just never came up with how to use it. Well, this was it’s shining moment. I seasoned the scallops with salt and pepper and pan-seared them in butter and olive oil. I set them aside, wiped out the saute pan and added more olive oil and butter to the warm pan along with lemon juice, salt, pepper and tarragon. 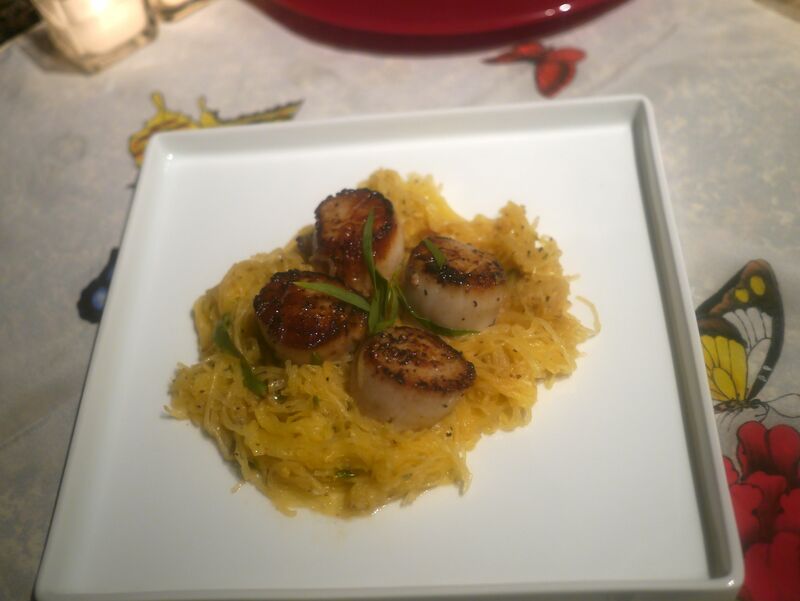 I had prepared the spaghetti squash earlier in the day so I tossed the spaghetti in the sauce, platted it and rested the scallops on top along with a few more springs of fresh tarragon. Simply delicious!!! I did a bit of prep early in the day..strawberries, squash, dessert…but the meal itself took 20 minutes to get on the table. It was beautiful, economical and pardon the boast but probably the best Valentine meal in Memphis. 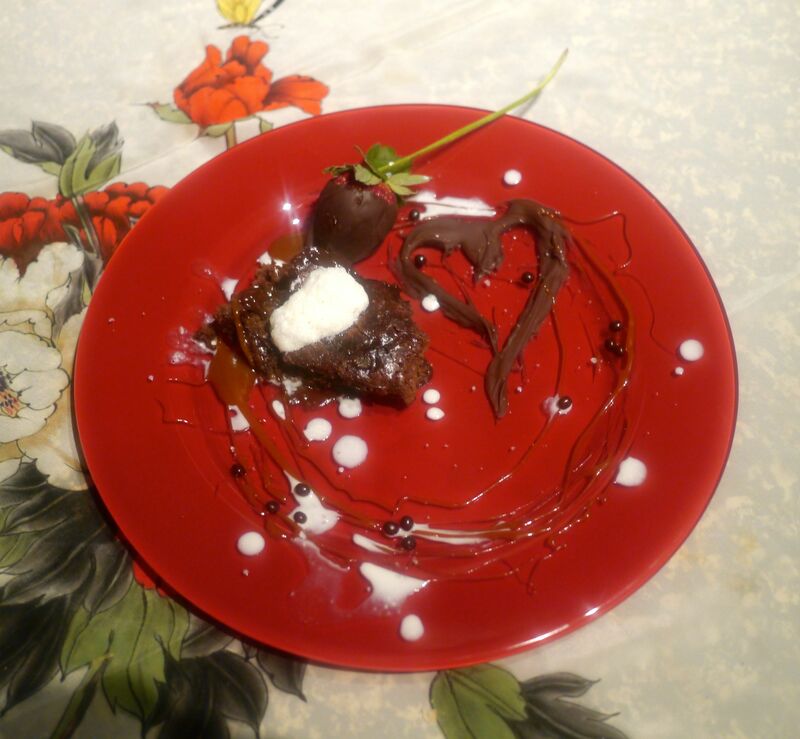 Early in the week Jennifer at Bake or Break posted on Facebook asking what was everyone making for Valentines dessert. I looked at her options and immediately chose Chocolate Cobbler. I’ve been served the dish but never made it. Please put it on your to-do list. Even if you don’t bake…your love ones want you to bake this. And, when it says pour a cup and a half of hot water on top of the batter…just trust Jennifer. It’s the best combination of cake and pudding you will ever put in your mouth. Here’s the finished product. And, here’s Chocolate Cobbler with Salted Caramel, Chocolate Pearls and Creme Anglaise. I’m sure I should’ve saved this and posted it two weeks before Valentines 2014. However, life is short…you may want to dress this in pastel or Red, White and Blue and do it for Easter or Fourth of July. When you do I promise your house will be lovely and a good time will be had by all. Thanks so much Robert; please pass the address to others.